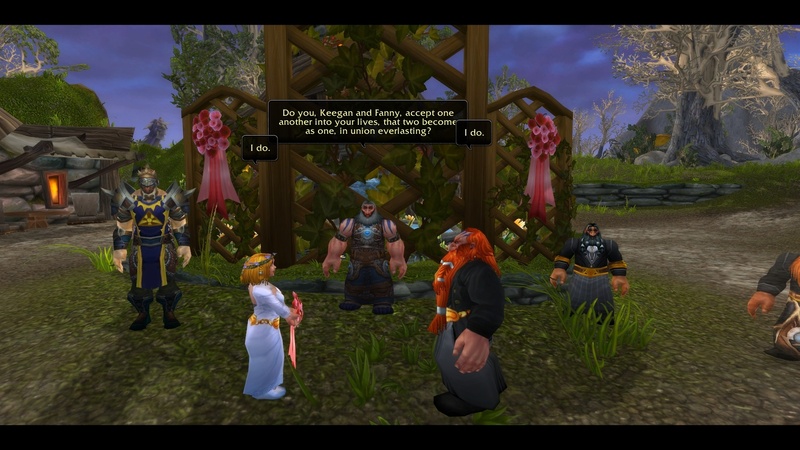 By popular request I am now pleased to offer World of Warcraft ingame virtual wedding ceremonies. Ceremonies performed at Stormwind Gazebo. [Behind the Cathedral, next to the cemetery], for the Alliance players and in Falconwing Square by the fountain for the Horde players. Priest will perform the ceremony, the script of which will be emailed to you in game prior to the event. Pictures will be taken. Cost $10.00 US paid via secure PayPal invoice, covers ceremony, certificate and two photographs mailed to the address on the PayPal payment. More to come soon. Please email revdebi and state the Faction, Realm and desired time of the ceremony. The virtual ceremonies are not legally binding and are for in-game purposes only. For those couples who are getting married IRL and also wish to celebrate their marriage in-game the virtual ceremony will be performed at no extra cost as an add-on to the actual marriage ceremony. The same certificate and two photographs of the wedding will be supplied to you at your legal address. World of Warcraft is owned by Blizzard Entertainment and this wedding service is for entertainment purposes only and not affiliated in any way with Blizzard. This is a virtual service and has no legal import. It’s just for fun. The fees cover the certificate and photographs. An intimate two ring ceremony with members of their guild and some guests in attendance. Followed by a Great Feast in the Temple Gardens. The couple honeymooned in the Eastern Kingdoms. Renodrach and Nuite. Married May 25th 2012 at The Howling Oak, in Darnassus on Darrowmere. Officiant ~ Oisian.